Get ready for a new Android Browser! 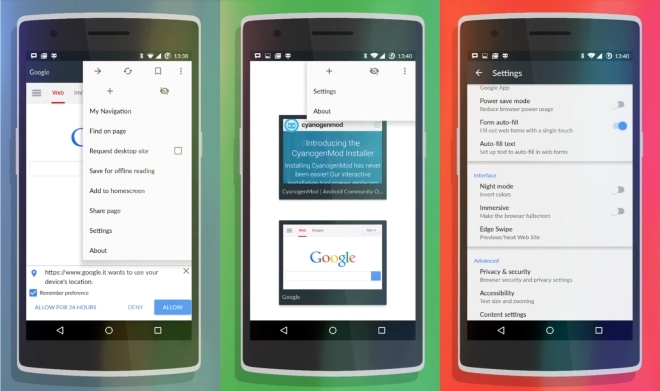 Android ROM developer CyanogenMod has announced that it is working on a new browser for Android devices. Dubbed Gello, the open-source browser is based on Google's Chromium project and includes a ton of customization options for Android. The team provided a first look of Gello through a demo video that actually reveals a lot about the new Android browser. Moreover, Lots of other granular controls. The Gello web browser would be aimed at those who prefer Android Open Source Project (AOSP) versions instead of Google's Android. The team noted that the Gello browser will not be released on Cyanogen operating system that runs on the popular OnePlus One mobile phone, as it is a separate project handled by Cyanogen Inc. However, it would most likely be part of the future version of CyanogenMod's Android ROM, and it is possible that it could be installed directly on other Android devices as well. The Gello web browser is still under active development phase and the CyanogenMod team does not yet have a release date for Gello, but it would be no surprise if you find it arrives in the Google Play Store at some point.